I told you they look pretty sad don’t they!?! Hmm…what to do. I started by cleaning them up and scraping off the rust, then sealing with Rustoleum Stop Rust here . Now I don’t have to worry about rust again. Then I painted them with Rustoleum 2x Green Apple Spray Paint here. I was really getting excited about this project, I had so many different ideas. I decided to make one a lady and the other a man. I used a red sharpie for the lips of the one lady frog. I decided to decorate the frogs with those vase fillers, or gems, you can buy at the Dollar Tree They come in so many pretty colors. I used Goop adhesive, I already had, because it's great for the outdoors (heat and rain) and dries clear. I went to the Dollar Store and purchased a bunch of the vase fillers in different greens and blues. I then headed over to Walmart and purchased the small green packages with the black net have the plain (non shiny) kind of look like pale sea glass gems you see below. To give the gems (ones from Dollar Tree a crystallized look, I baked them on a cookie sheet at 450 degrees for 20 minutes. This is the same as we used to do with marbles…way back when. After 20 minutes, I carefully, (the gems and pan are very hot) let them drop into a bowl of ice water I had ready for them, and you can put the sheet on top of bowl with ice…just to be safe. See how the insides are cracked…they sparkle so much more….aren’t they pretty! I first started out by painting their bodies with a green spray paint from Rustoleum 2x. Great for outside, doesn’t lose its color. I used the darker round blue for the males guitar. I used the flat green gems for their bodies. For the mouth I used stones of same color that didn’t sparkle. I used the flat ones for the bodies and mouths of the frogs. I painted the girls tongue yellow….Put in the turquoise fillers for their eyes. I used the round gems for their guitars. Above they are in rose garden, and look adorable!! What a difference a little paint and glass fillers can do! I was thinking of a pond. Wouldn’t it look pretty where they are standing in the roses and fill it in with the turquoise and green gems..I think that will look so pretty and sparkly…I will need a lot of gems….hmmm. Now this is where my perfectionist brain comes in. They were all set up in the rose garden, but I couldn’t see them from the house the way they were situated. So back to the drawing board. Now in the meantime while I was trying to figure out a place for it, another idea struck. I remembered I had a pallet ….Now I was getting another idea. I painted a pallet in blues (my favorite color). Don’t you just love those colors! Rustoleum 2x Green Apple, Ocean Mist , Aqua and Cornflower blue. I was planning to make it a herb planter, but hopefully, I can always find another. Then a idea struck! since the frogs were ready, I could make this a neat backdrop for them. Then I thought of making it a billboard with their stage names on it. I made the letters with the glass gems from the Dollar Tree. lots of fans!!! Even Mr. Turtle showed up! This is how it will sit for the next couple of weeks. I did put a solar spotlight on it for nighttime performances. Its positioned so when I’m sitting under the pergola, it’s like they are performing for me! Imagination sparks creativity! I think I am going to add some color to their fans!!! So what do you think? Did I give you any ideas? Oh, they came with me Bernice! I put the post up for you to check out how to do the marbleizing . I love how you refurbished them! Your pallet is adorable! I kinda went overboard a bit….sometimes I can’t slow myself..haha. I sit outside and I swear they relax me! How adorable, and so creative!! What???? You walked with bats?? We sat at around 8pm and watched as they flocked from the sky to the trees in the bark…beatiful sight i had no idea they lived amoung us in our town like this. Then they set up huge nets, we walked in the dark (with some flashlights) and they caught bats to tag and release them. I guess there is a bat disease that is putting them at risk for low population. We got to see them up close in their hands AMAZING! I have been wantinf a bat hoise in my yard ever since. Hubz and I hope to buold one this year. ☺️❤️️ Bats scare me! They come out when first dark and are flying all around. Very cute… But where do you get all that energy?! Truthfully, I don’t know. I am retired so I do have a lot of time on my hands! 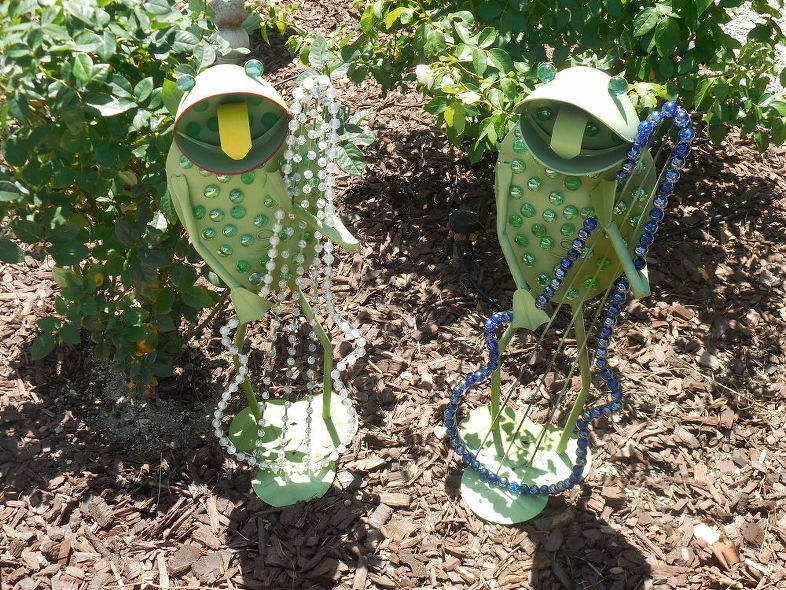 Love what you did with frogs and how you made a frog pond up. You’re very creative.